Last weekend I rescued a Siamese kitten. I've always admired Siamese from afar but never thought I'd have one of my very own! He was in a pretty bad situation and the person he was staying with had no answers to my questions on his history. 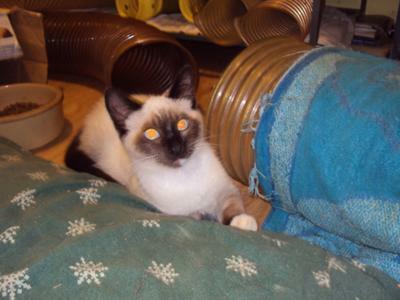 So I am venturing to guess he is a Seal Point Siamese mix..... with perhaps some Snowshoe? I have always had cats but your typical moggies so I'm not familiar with anything like breed "standards". I just know he's won our family over already and we love him a lot! 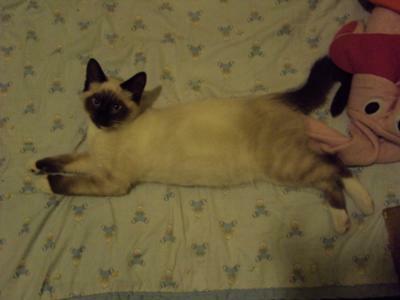 Aww he looks just like my Hixxy, a seal-point Snowshoe Mix. Hope this helps. He looks exactly like my cat Choco! I bet he has a wonderful personality. 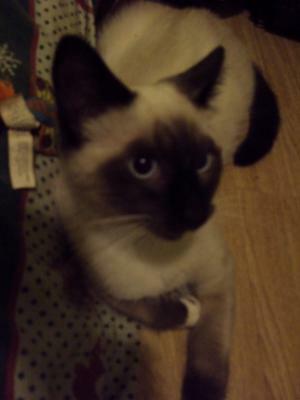 I call Choco a "Snow-man" because he's short-haired like a Snowshoe but has more Birman-type markings. :) Maybe Solomon is a "Snow-man" too. His points do look Seal-colored and with his blue eyes he certainly has some Siamese in him. He's lovely. He looks like a real character, and he's lucky to have found you. I hope you continue to enjoy each other!